When you arrive at any of the possible entrances onto the Amish Trail, please know that you are distanced from city life, busy streets and rush hour traffic. Commonly described as pastoral, original, or unblemished; this non-commercialized Old Order Amish settlement is filled with wonderful and interesting attractions. You will come upon many Amish Buggies that are going at their comfortable speed of 10mph. Don't be in a hurry to get around them. Slow down and appreciate the countryside. If you must pass, please wait until it is very safe to do so and do not honk your horn as you may startle the horse. Because we are out in the country, do not expect to find the typical modern day conveniences you may be accustomed to. The closest fast food restaurant will be at least 15 miles from anywhere you may be along the trail. We have many fabulous locally owned restaurants along the way. Public restrooms and gas stations are not something you will find on every street corner either. The Amish adhere to a Christian faith and belief system that values community, unity, family, faith and hard work. In our area, the Amish are considered to be Old Order, which is a very conservative and traditional community living without electricity, phones, cars, and other modern conveniences. Most commonly recognized by their plain dress, horse and buggy transportation, and old fashioned farming practices; they live an intentional lifestyle that separates them from the modern world and is centered around their families and Amish community. They make a living from farming and handcrafting products for sale. What do the Amish make and sell? They produce a variety of goods including quilts, rugs, baked goods, jams, candy, furniture, baskets, woodworking, toys, eggs, homegrown fruits & vegetables, leather, lumber, iron works, and more. Where are the Amish shops? The Amish sell their products from their homes - the Amish Trail map will help you locate their businesses. Look for a sign in their front yard and an open sign to direct you. You will not find any large Amish stores or commercialized Amish shopping areas or attractions. Rural, small town, personal and friendly is what characterizes this area instead. A truly authentic Amish experience! We have a wonderful map, either online or in print that designates much of what you will need to ensure your visit is pleasant and fulfilling. These maps may be picked up at any of the businesses listed on this site as you enter our area. There is not one "Amish Store" like something you may find in Ohio or Pennsylvania. These are all small, individual shops with small, sometimes handmade signs designating what they sell or denoting when they are Open/Closed. When are good times to visit? Please do not take photos of the Amish people. You may stop at any of the designated shops where you will find an OPEN sign, but please respect that this is a community with homes and families just like yours. No shops will be open on Sundays throughout the Amish Community, and many of the “English” shops will be closed as well so plan accordingly. Wednesday is another day, not always, that you could find some of the Amish shops closed. The fact that these people tend to gather together for weddings, funerals, barn raisings, and other "family" functions is the reason you may find this to be the case. Unfortunately, you may be thinking this would be something wonderful to view, these functions are not open to outsiders. Where is the Amish Trail in New York State? 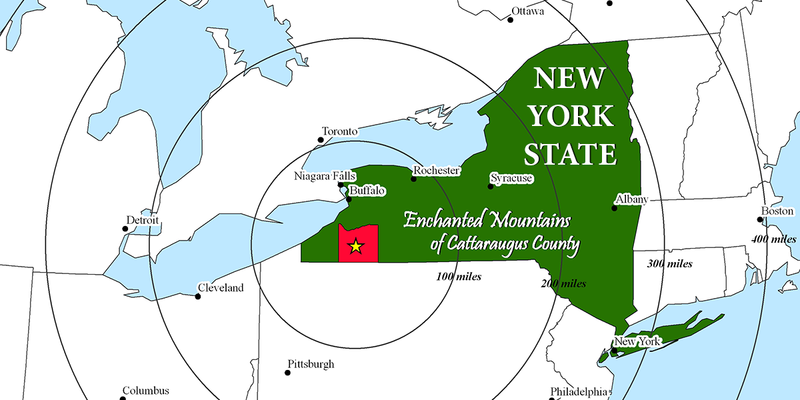 The majority of New York's Amish Trail is located in the Enchanted Mountains of Western New York State (Cattaraugus County) and others in to the Chautauqua-Allegheny Region of Western New York. Learn more about the places to discover on the interactive Map or on the Amish Trail Brochure & Map.